It’s no secret that mobile devices aren’t the most secure devices on the planet. Every week there seems to be another hacking perpetrated against one celebrity or another. The buck doesn’t stop there, as detailed in a previous article, even the United States Department of Defense is not as secure as it would like to think. The question is then, if such high priority individuals and institutions aren’t safe then, where does that leave the rest of us? As it happens, Zimperium Enterprises has come forward with their answer. Zimperium, a small, San Francisco based startup, has developed the world’s first mobile intrusion prevention system (zIPS). 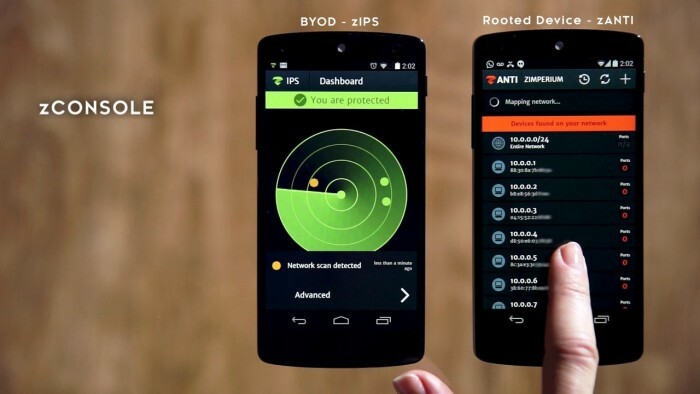 This system, called the Zimperium Mobile Threat Defense Suite, has been designed for all mobile devices in mind. It is the intention of the suite to secure business and personal devices from being compromised from outside attacks. In addition, Zimperium has further developed their defense software to allow devices to be probed by IT and security professionals to check for vulnerabilities. The main concern is the lack of security on the day to day business operations done on unsecured public WiFi. Business done in the field is not necessarily non-secure, however, when a device leaves the security of a home network there are vulnerabilities that need to be considered. In a previous article I highlighted the rise in cyber crime and cyber terror attacks. This rise makes mobile security all the more important. Think about the information a person has on their phone. Pictures, phone numbers, and, address and password information are just a few that come to mind. That is not to mention the information that could be gained by an attacker through your apps once they know the password. It is not hard to imagine an attacker gaining access to my banking information through one of my many banking apps in the event of a security breach. The risk is taken up a notch when you consider the kind of information on business devices. You can take that risk well beyond the bleeding edge when you consider the rising number of mobile devices being used in government and military bodies. With that said, mobile security has become all that much more important. With data becoming more and more accessible through a variety of platforms, stringent security measures are going to become the new norm. Whether or not they work is going to be anyone’s guess. Still, something must be done to protect not just the name of business, but the name of the average consumer as well. Are companies like Zimperium going to be the new players in the game of information security? As always time will tell. What is both certain and empowering is the knowledge that someone, somewhere, has already thought of this and is working to make this part of the world a safer and better place. Though I may never come to use the product personally, I rest a little easier knowing that it is there should myself, my business, or, my colleagues, ever need it.